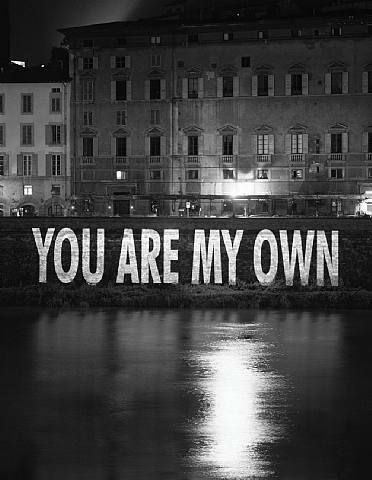 I’ve been meaning to write about Jenny Holzer for some time now, but every time I do I feel a little bit intimidated, or even scared by the prospect of trying to put down just how inspired I feel by this artist, or whether a blog post will at all express just how amazing she is – however bias I am. However, starting up this new regular blog feature of Muse Monday, I felt the only person that could possibly kick it off was Jenny. This combined with another recent visit to Newcastle, where when I was there earlier in the year I was fortunate enough to experience an exhibition of hers at the Baltic Gallery, brought her to the forefront of my mind again. Jenny is a conceptual artist, now, there’s obviously been a considerable amount of controversy over the years when it comes to conceptual art. The Young British Artists and that whole furor that was caused by the like of Emin and Hirst in the 1990s was something that I had a slight inkling of when growing up because it was all over the English newspapers. So much so that, in fact, the phrase conceptual art really became a term of derision. I remember being young, and never quite understanding the merits of conceptual art, I didn’t really understand the merits of any art truth be told, I knew that skill was required to paint and that a good painting was a good thing. But art such as that of Emin, and even Hirst, I just didn’t get, a lot of people didn’t and to a degree, I still don’t to this day. However, whilst I don’t profess to being knowledgeable about this sort of thing, I do know what I like. And I like Holzer. Alongside the ‘artistic merit’ of conceptual art, there is often the question raised about artistic skill, one of the things about conceptual art is that it doesn’t require the skills required for more traditional mediums of art, for instance, you don’t really need to know how to use oils and canvass. What got me about Jenny however, is that in using words as her art, taking concepts such as ‘Truisms’ through to her most recent collection, that I was fortunate enough to see whilst in Newcastle, of her Redaction Paintings that reproduced recently released declassified memos with much of the text blacked out by censors. She explores what it is to be human, in sometimes a deeply unsettling, sometimes deeply beautiful way, and that does take skill and I can see the merit in that. Probably her most famous work, ‘Truisms’ and her first exploration into using text as art, is really still my favourite. The amount of time and skill and thought that they both render in others, and must have taken out of her to imagine are both inspiring. They are ‘aphorisms’ or ‘original thoughts’ and are seen as being in that most inimitable of genre’s that of ‘wisdom literature’ and in that, they’re completely mind blowing. I use the one that I fell in love with the moment I read it at the start of my novel, it sums up how the novel moves, and how my life moves, it inspired such a love for the word trouble in-fact, that I recently got it tattooed on my back. Anyway the truism is. AND THERE WILL BE TROUBLE. I can’t recommend her work enough, you should definitely follow her on twitter to get a daily dose, you should read up about her on her wiki, check out her website and watch the interview with her below. Explore, enjoy, feel inspired. Tagged as aphorism, emin, hirst, jenny holzer, truisms, wisdom literature, young british artists.